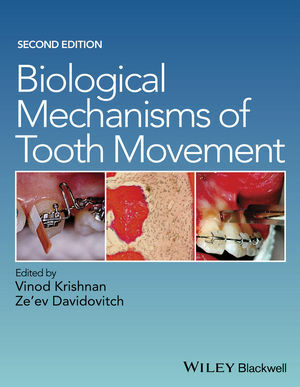 Biological Mechanisms of Tooth Movement, Second Edition is an authoritative reference to the scientific foundations underpinning clinical orthodontics. Led by an expert editor team and with contributions from an international group of contributors, the book covers key topics including bone biology, the effects of mechanical loading on tissues and cells, genetics, inflammation, tissue remodeling and the effects of diet, drugs, and systemic diseases. Highly-illustrated throughout, this second edition has been fully revised, updated and expanded to new developments in genomics, rapid orthodontics and current controversies in tooth movement research. Trainees, qualified specialists and researchers in orthodontics can rely on this comprehensive text to inform them about the clinical and scientific implications of the biological mechanisms involved in the movement of teeth. Dr Krishnan’s research interests in orthodontics revolve around the biology of tooth movement, side effects of orthodontic mechanics, interactive and interdisciplinary orthodontics and the latest innovations in orthodontic materials. He maintains a specialty orthodontic practice alongside his academic post, and is, with Dr Davidovitch, the co-editor of Biological Mechanisms of Tooth Movement, 1st edition (Wiley, 2009) and Integrated Clinical Orthodontics (Wiley, 2012). Dr Davidovitch is an authority on all aspects of clinical orthodontics and the associated biological and medical connections but has particular expertise in the effects of low level electrical microcurrents and piezoelectric phenomena in bone during tooth movement. His publication list contains over 100 articles and book chapters and with Dr Krishnan he is the co-editor of Biological Mechanisms of Tooth Movement, 1st edition (Wiley, 2009) and Integrated Clinical Orthodontics (Wiley, 2012).